Podiatrists are university trained allied health practitioners who assess, diagnose and treat health complications affecting the feet and lower limb. The average adult takes 4000 to 6000 steps a day which can result in 75-80% of the adult population having some form of foot and or leg problem. Keeping this in mind, it is essential that your feet are looked after properly. Podiatrists will carry out a consultation tailored to your needs. Podiatrists determined the nature of the problem and specifically target the treatment regime to solve the problem, not just temporarily relieve symptoms. Each and every consultation varies depending on the presenting complaint. Therefore the treatment regime may incorporate only a one off visit, regular reviews of general foot care, footwear assessments, biomechanical consultations, orthotic fitting or referral to other specialists for ongoing care. Do I need a referral to visit Active Feet Podiatry? Anyone can make an appointment at Active Feet Podiatry. If you are deemed eligible you may be able to be referred under the enhance primary care program (EPC). However, a GP’s referral will be required for this so as to claim the consultation under Medicare. A D904 obtained by your GP is necessary for DVA consultations and Work-cover requires approval from your employer and their workers compensation cover. Does my health fund cover podiatry? Private health funds do cover podiatry but the level of cover varies dependent on the level of cover you have chosen. Active Feet Podiatry would be happy to provide you with item codes, you can then call your own health fund and find out directly what your personal benefits are for podiatry consultations or specific treatments. At Active Feet Podiatry we have a HICAPS terminal, which allows you to claim directly after each consultation and therefore only need to pay the ‘GAP’ if required. To be eligible for podiatry cover under Medicare you have to be deemed eligible by your GP. Eligibility is determined by the GP with which they may diagnose a patient with a chronic condition (such as diabetes, debilitating arthritis, severe peripheral vascular disease or idiopathic neuropathy.) With this diagnosis an Enhanced Primary Care Plan may be issued and lodged with Medicare by your doctor. This plan may entitle you to 5 podiatry visits a year. Although it is a total of 5 visits a year issued between all allied professionals. This it at your doctors discretion. If you think this may apply to you, then contact your doctor to arrange a consultation and discuss this with them. If obtained, contact Active Feet Podiatry and we can bulk bill all general consultations, or a small gap may be taken for more extensive consults. Does Active Feet Podiatry accept EFTPOS or credit card payments? Does Active Feet Podiatry and disabled or wheelchair access? Active Feet Podiatry has ample disabled parking spaces, which are approximately 20m from the clinics front door. There is a small ramp allowing ease of entry for wheelchairs, frames and walking stick access. I have diabetes, how can Active Feet Podiatry help me? For all diabetic patients we carry out a thorough diabetic foot assessment annually, and at each and every consultation following a cursory neurovascular assessment is performed. Diabetic education is discussed at all consultations and in particularly how to maintain healthy feet and avoid diabetic foot complications. We also stress the importance of appropriate footwear and referrals are made if deemed necessary. 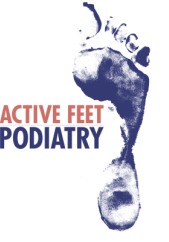 How do I make an appointment at Active Feet Podiatry? Please call 0404 048 866 or email info@activefeetpodiatrykiama.com.au and we would be happy to schedule an appointment ASAP or alternately see our contact page for more information.